Seen here is the upper 20′ of a giant kelp forest. The kelp grows from the ocean floor, 30-100′ below, all the way to the surface where it continues growing, spreading out to form a canopy. This species of kelp, Macrocystis pyrifera, is the world’s fastest growing plant (if you want to consider this algae a plant), growing over 2′ per day in ideal conditions. The kelp is buoyed upward in the water by clusters of pneumatocysts, gas-filled bladders at the base of each leaf-like blade. A museum client has licensed this image for a 7′ x 10′ museum metal wall display. Magnet-backed life size photos of kelp forest creatures will be placed by kids on the wall. It sounds like it will be a cool exhibit. San Clemente Island, California, USA. 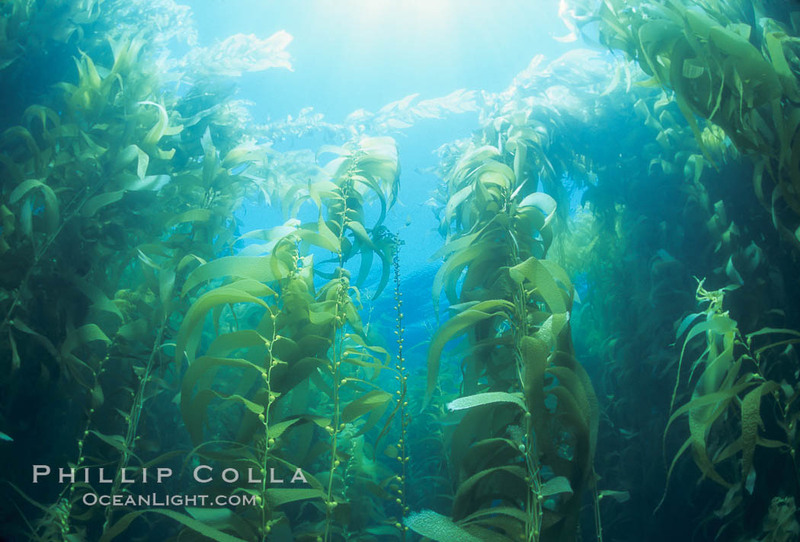 Keywords: kelp forest photo, giant kelp, Macrocystis pyrifera, San Clemente island, underwater, diving, photograph.